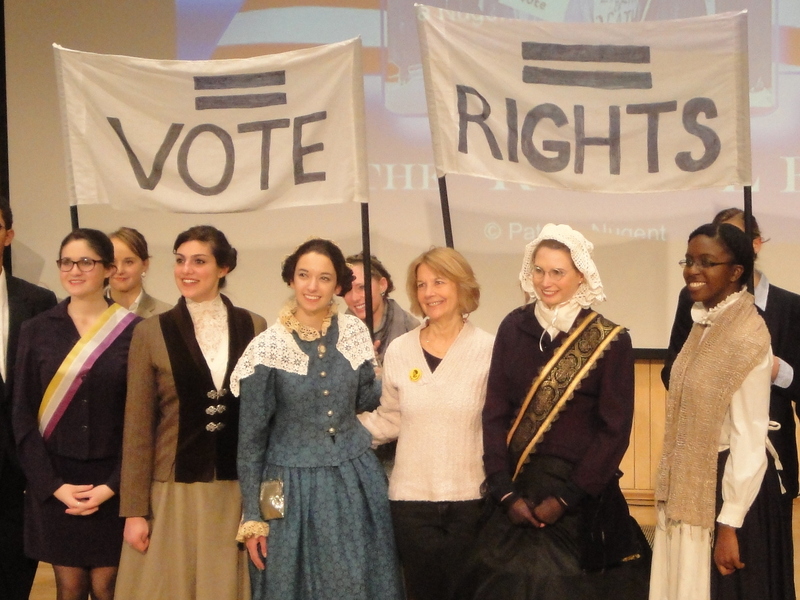 The Stone that Started the Ripple is a humorous dramatization of a modern‑day reunion of suffragists, women who devoted their lives during the last half of the nineteenth century to fighting oppression. Female suffrage was the longest single political battle waged in American history, lasting three‑quarters of a century. It was led by just a handful of women primarily headquartered in upstate New York. The battle was waged through the writing and distribution of political articles, speeches, petitions, pamphlets, letters, pleas and testimonies. It is estimated that two million women contributed to the effort in some way, making it the greatest independent political movement of modern times. The actual words of Susan B. Anthony, Elizabeth Cady Stanton, Lucretia Mott, and Sojourner Truth are embedded in the script. Parts of the reunion conversations are, of course, fictional but are based on a review of literature about these women ‑ their lives and the times in which they lived. The anachronisms are intended to dramatize the relevance of their work to our lives. The portrayal is based on information that suggests that these highly liberated and intelligent women were also actually quite humorous, witty, warm, sympathetic, attractive and brightly arrayed despite efforts at the time to paint the movement as a “petticoat rebellion” run by “Amazons” and “love‑starved spinsters”. This play was written to help girls and women understand their roots and appreciate their hard-won freedoms …and the challenges that remain. For as Susan B. Anthony said, “We little dreamed that half a century later we would be compelled to leave the finish of a battle to another generation of women. But there is an army of you where we were but a handful”. The Stone has been performed five times to a sold-out house, earning standing ovations and an exceptional review from a well-known Saratoga Springs art critic. Please leave a message below if you would like me to contact you regarding a performance or an opportunity to bring these women to life through a presentation on the suffragists. Thank you to all who have attended a performance of The Stone that Started the Ripple and for all the words of encouragement you have offered. I am grateful that you are interested in helping me tell the story of these incredibly brave women. As Susan B. Anthony said, “Failure is impossible!” But her words will only ring true if WE spread their message of equality and social justice, as the ripple in the pond they declared us to be.